Tim posted an excerpt written by H.L. Mencken at the time of the Scopes Trial, 1925. It's about Beethoven. Go read it now: Beethoven and the Scopes Trial. Reading it is important because Tim's bosses probably peg his salary to how many hits his blog gets. The excerpt really pushed my buttons. It smacks of vile cultural elitism coated with that sickeningly childish Beethoven worship which I hate so much. It made me want to rant. Of course it's entirely possible that Mencken has his tongue firmly in his cheek. How am I to be sure - with no smiley faces in the text? It starts out like one of those "There are two kinds of people..." jokes. For example: "There are three kinds of people - those who understand math and those who don't." Warning: certain mathematical concepts will be abused in this post. The intellectual heritage of the race belongs to the minority, and to the minority only ... That is why Beethoven survives. Of the 110,000,000 so-called human beings who now live in the United States ... it is probable that at least 108,000,000 have never heard of him at all. Let's take Mencken at his word and stipulate that in 1925 about two percent of Americans actually knew who Beethoven was and the rest would have lynched him in the street for the crime of being meaningful and for coming back from the dead. But times have changed. Allowing for the three-fold increase in U.S. population, no one could claim in 2008 that only 6 million Americans have ever heard of Beethoven. Any other composer (except Mozart), maybe, but not Beethoven. I wanted to shout back at the excerpt: "Hey, H.L. Now-a-days, thanks to our limited choices of infotainment conglomerates, the U.S. is homogenized pretty thoroughly. We've all heard of the same stuff - including Beethoven." Most of the answers were immediate, almost joyful. The exception was Claudia, secretary at an auto repair shop, who needed nearly a minute of her deepest cogitation before she came up with an answer, any answer (which she mispronounced.) But she knew "Beethoven". Daniel's unexpected answer stems from the fact that he's a professional composer, the only trained musician in the sample. He cheated by thinking for several seconds before answering. My poll has a probable margin of error of 25%. Remember: the "probable" - like Mencken I make up facts too. Please attempt to reproduce my results with polls of your own and post the probable results as comments below. CONCLUSION: Forty-four percent of all Americans think of Beethoven first when they consider classical composers. If the question instead had been "Who is Beethoven?" my poll would have shown name recognition of 100% or more. That's because anyone who knows of Bach, Mozart, Brahms or Takemitsu probably knows of Beethoven too. Poor Ludwig is now a cultural icon considerably separate from the appreciation of his music. Beethoven, who could still write music even after he went deaf. Beethoven, who overcame insurmountable obstacles. The Beethoven of Disney movies, disco hits, dog movies, strange rock band names and the John Thompson arrangement of Ode to Joy, among others. We have made Beethoven's life's lemonade into a cultural kool-aid so diluted that everyone has tasted it but no one need be affected by it. The more diluted he becomes the less meaningful he gets. If people don't know why Beethoven is famous, they still know that he IS famous. Famous for being famous. Zsa Zsa Gabor. Mencken goes on to tell us what would happen if the 1925 unwashed did take notice of our hero composer. He doesn't even say "probably". If [Beethoven's music] could be brought within range, it would at once arouse hostility. Its complexity would challenge; its lace of moral purpose would affright. Soon there would be a movement to put it down, and Baptist clergymen would range the land denouncing it, and in the end some poor musician, taken in the un-American act of playing it, would be put on trial before a jury of Ku Kluxers, and railroaded to the calaboose. Okay, I get it now. Beethoven is really a stalking horse for Mencken's real target - the anti-teaching-of-evolution crowd. He wants to show us how stupid those people really are by telling us about the bonehead stunts they would pull if they catch up with the poor unsuspecting Ludwig. How much have things changed since 1925? Suppose that in 2008 a teacher were arrested somewhere in America, just as John Scopes was in 1925, for telling his class about evolution. Could it happen? Would you be surprised? I wouldn't. The battle over teaching the idea of evolution continues to this day. 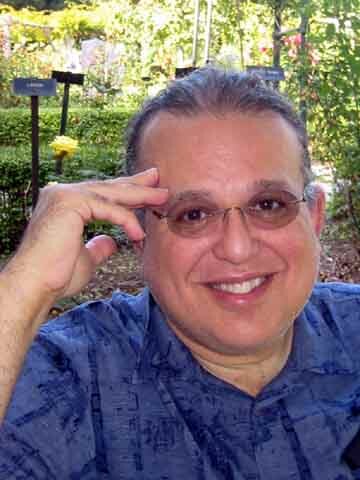 Could a contemporary journalist attack the opinions held by creationists (or neo-cons or right-to-lifers or some other deserving group) by describing their probably hateful retribution on a ... composer? A composer of music? I doubt it. A blogger might try it, but not a real journalist. Which composer's villification at the hands of the cretinous masses would arouse the most sympathy among us - the good people? Copland? Carter? Leiber and Stoller? Keith Burstein? Richard Thomas? In the wildest journalistic imagination could any composer be plausibly turned into the next Andres Serrano or Robert Mapplethorpe? In a word, no. That is because it is probable that 98% of all Americans these days don't know any contemporary composers at all, and if they did - unlike in Mencken's hypothesis - their reaction to finding out about them would be the shrugging of shoulders and the changing of channels. And what of Poor Beethoven in all this? Suppose he did come back from the dead, hearing restored, to observe the holy adulations he so regularly receives. What would he think of his universal name recognition? Would be giggle nervously when asked about Immortal Beloved? I don't know. But it is probable that if he actually listened (for the first time ever) to a performance of his own Ninth Symphony he would say "That's awful. I must completely rewrite it." 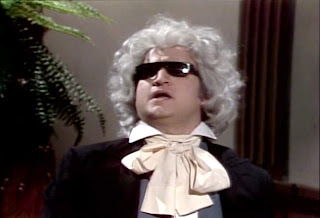 The picture of John Belushi as Beethoven channeling Ray Charles on Saturday Night Live comes from here. 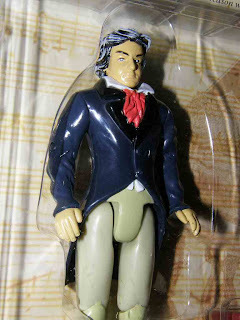 The Beethoven figurine picture comes from here. 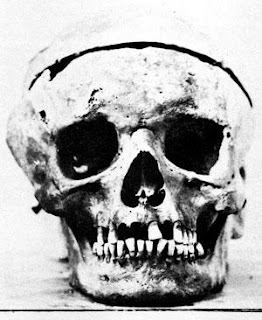 The picture of Beethoven's skull comes from here. 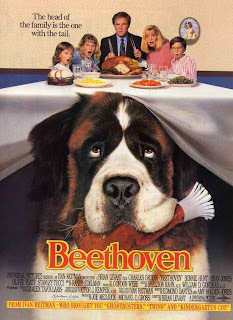 The picture of John Cleese as Beethoven comes from here which also has a story about how poor Ludwig might have died. 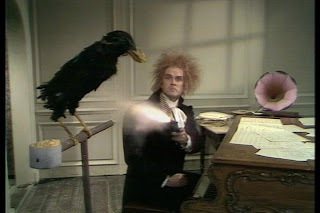 The script to Beethoven's Mynah Bird, a sketch on Monty Python's Flying Circus, is here. 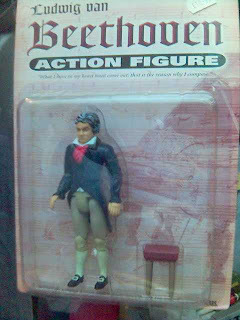 The Beethoven action figure pictures come from here and here. 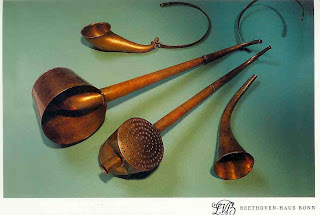 The picture of Beethoven's ear trumpets comes from here. 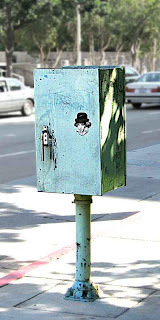 I took the pictures of the Ludwig sticker (which looks like Johnny Depp) on the traffic box in Civic Center, downtown Los Angeles. Click any picture for an enlargement. your whole post sums up why classical music and print journalism is dead. at the end of the day putting forward any composer smacks of cultural imperialism. ok... i'll take tim's bait. who would we put forward to lead the way today? glass? adams? elliot carter? as far as i can tell the only use for "modern music" is to sell expensive consumer "lifestyle choice" products to those who need to surround themselves with the trappings and symbols of the "elite" and autocratic tribe. after watching years of "law and order" its easy to see that mencken is using one of the oldest tricks in the book. appeal to your audience by painting those "other people" as toothless rednecks, when of course they are the toothless rednecks he was trying to reach. in Tim's defense, he didn't make any comments about the Mencken passage - beyond posting it (whatever that means). I saw a commercial for A-1 Steak Sauce with a Bach Brandenberg playing in the background. Is that better or worse than Jimi Hendrix selling soft drinks? 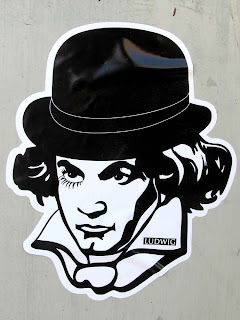 That sticker version of Ludwig looks more like Johnny Depp as Alex (or one of his droogs) from A Clockwork Orange. Mencken may have had to revise his opinion if he wrote about Beethoven after 50 years of pop culture, thanks to Kubrick's film, Schroeder, and my first choice when asked to name a composer, Don Music. Thanks Ben, I wasn't familiar with Mr. Music's oeuvre previously. Your link does show him more as songwriter than as classical composer - and the problem he is discussing is one associated with lyricists rather than composers - but who cares, because the full ensemble finale is quite wonderful. Ben - about the sticker - it does look like this, you're right. 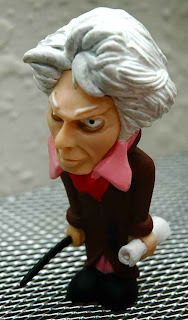 If you click on my picture for full size, it clearly says "LUDWIG" on his lapel. Long time since I've watched that movie - I'd forgotten both that and the Peanuts connection. Thanks again. -->could any composer be plausibly turned into the next Andres Serrano or Robert Mapplethorpe? Sure. I just read a review from 80s by a not so prominent LA crit about a pretty prominent LA composer in which the reviewer walked out after ten minutes because "nihilistic chaos can be hazardous to your health." Of course the critic was only there because the brilliant tendency of 1980s organizers to willfully confuse and disorient people. The vectors are different today because there is more than one elite. There was in the 1920s too, but they never got to write in the paper. I think Mencken ought to be considered in context in which the US Government, those who were elected by sweet sweet democracy, were the ones suing Scopes, being hypocritical, siding with the kkk etc. etc. Today, the government is much more likely to sue the teacher who teaches creationism (maybe). And more likely than either of those scenarios is the student who sues the teacher/school/state for oppressing her/his right to feel ways about things. At any rate, I am a bit confused as to why Mangan posted this excerpt sans context. I didn't really register it as about "Beethoven" but about the failings of democracy at that particular time... I feel the same way when presidential candidates announce that a marriage is between a man and women. They probably don't even understand how great Phranc is...or Marilyn Manson? or the Beatles? I don't know... I'm not as clever as Mencken...and I am too lazy to put links to appropriate and comical clips. Anyway, hardly anybody knows who Serrano or Maplethorpe are either anymore. Elitism is not so great because it excludes. But cultural exemplarity remains important and allows for the possibility that the unwashed masses might actually start to dig your high art...or vice versa. > it as about "Beethoven"
Indeed! My problem was that I didn't make that connection right away. The idea of the poll and several initial versions of my rant were about Beethoven only. Later I realized that my violent reaction to Mencken's use of Beethoven as the macguffin. So I rewrote it attempting to stay on subject. "Mencken's MacGuffin" - good title for a piece of music. That was a review of an evening from New Music America 1985 that concluded with Johanna Went and Marc Wheaton, so, yeah it probably was an accurate description and yeah, they're not "composers" in same sense, but how often does music review end with the reviewer fleeing for their safety and admitting it!? The other composers at the show didn't get off much easier, but they did succeed in not driving off the toothless redneck in critic's clothing (or was that a failure?) There is a well-known review of John Zorn causing a critic to do the same thing, but I went with hometown flavor. It was a trick question: Mongolia has no capitol city. Back in 2000 I attended a dinner party (name drop) that included Lou Harrison. As a musical neophyte, I think I now qualify as a tad less phyt-e.